I don't know if it had been bathing but it didn't look wet. It may have been picnicking next to the river. 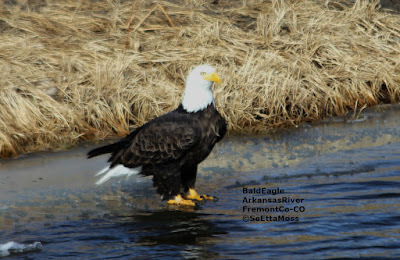 It flew off and perched several miles downstream in a snag over the river where I got the pics below. While perched it looked around but also looked up quite a few times. I couldn't see anything above it but I don't have eagle-eyes so could have been a bird/birds higher up out of my sight. Just for context, the eagle was about 250-300 feet away when it was down by the river and 400-500 feet away when perched on the snag.